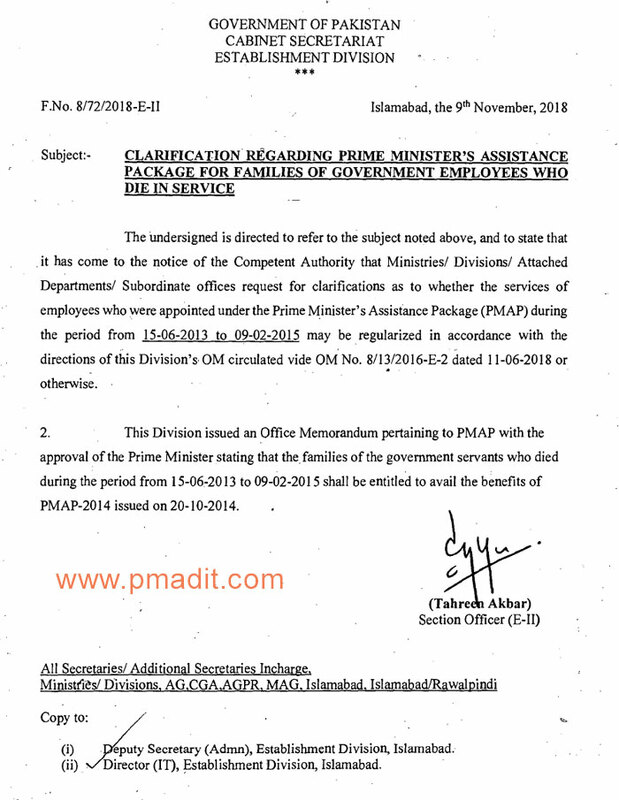 The Establishment Division directed to refer to the subject noted above, and to state that it has come to the notice of the Competent Authority that the Ministries/Divisions/Attached Department/Subordinate Offices request for clarifications as to whether the service of employees who were appointed under the Prime Minister’s Assistance Package (PMAP) during the period from 15-06-2013 to 09-02-2015 may be regularized in accordance with the directions of this Division’s O.M. circulated vide O.M No. 8/13/2016-E-2 dated 11-06-2018 or otherwise. This Division issued an O.M. pertaining PMAP with the approval of the Prime Minister stating that the families of the government servants who died during the period from 15-06-2013 to 09-02-2015 shall be entitled to avail the benefits of PMAP-2014 issued on 20-10-2014.